Word2PDF is a free Windows 8 Word to PDF Converter app for converting files in .doc, .docx, or .rtf format to .pdf format. The app lets you convert files present on your system, or the ones present on web. That means, you can specify address of a target file present on your hard drive, or the webpage URL where the file is located. Word2PDF is available freely under the Productivity category of Windows Store. You can conveniently convert your Word Files to PDF files using Word2PDF. When the Converter finish converting the file, then if you specify, it opens it up in the PDF viewer you have installed on your system. 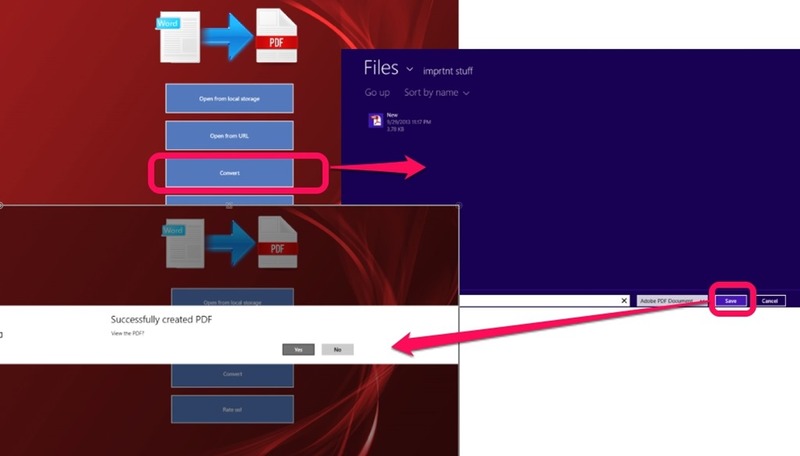 If you don’t have installed any such tool, Word2PDF will open it in the Windows 8 default PDF Viewer. Let’s get you a better idea of this free Converter app. As you get to the main screen of this free Windows 8 Word to PDF Converter, you will be provided with a number of options. All the options except the ‘Convert’ options will be enabled by default. Lets convert a file present on hard drive. In the ‘Open from local storage’ option, you can specify the file from your local disk which you want to convert. As you have specified the file you want to convert using this free Windows 8 Word to PDF Converter, it won’t be automatically converted into PDF format. After specifying the file you want to Convert, the ‘Convert’ option will be enabled. After that, you can click on the now enabled ‘Convert’ option to convert the file. As you click on the ‘Convert’ option, the free Windows 8 Word to PDF Converter will convert the File. You would be asked to specify the location where you want to store the created PDF file. Then, you have to specify whether you want to see the created file. Nice Interface: The interface of this free Converter is quite nice. Free availability: The Word2PDF is freely available in the ‘Productivity’ section in the Windows Store. Supports converting .doc, .docx, .rtf files to .pdf. Ability to locate any file from over the Internet using its URL and converting it to PDF. To wrap it up, I would like to say that Word2PDF is quite nice Converter app available with Windows 8. Its working is quite easy. You will understand how to work through the app in order to Convert your Word files to PDF. Although here, I want to mention one thing. The option to convert Word file using its URL did not work out for me. You have to figure it out for yourself, whether this functionality works out fine for you or not. Rest everything is fine with the app. I would really recommend using it.